During lent, I try my hardest to remember to make seafood dishes on Friday for my Catholic husband. I must admit, some weeks it works out better than others. 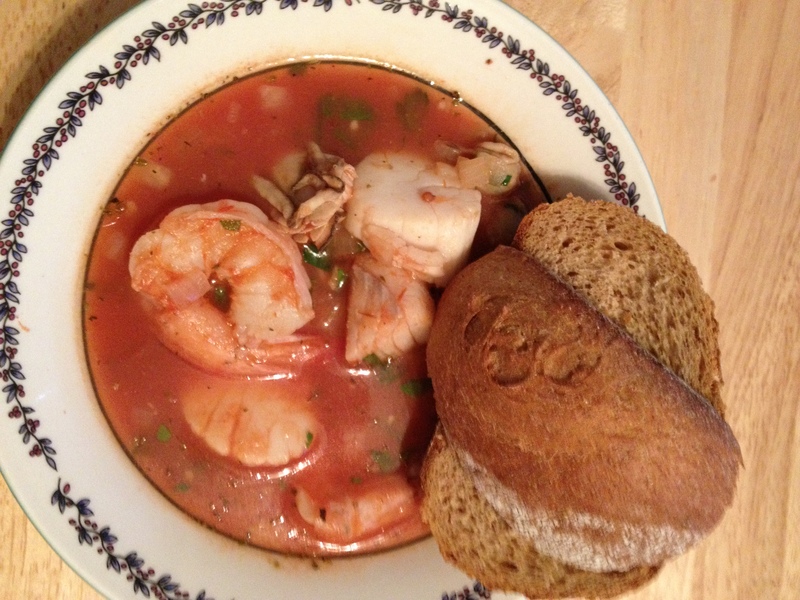 For Good Friday, I decided to try my hand at a quick and easy cioppino. This is one of my favorite rustic italian dishes. Best part? A healthy and nutritious one pot meal that can be on the table in around thirty minutes! 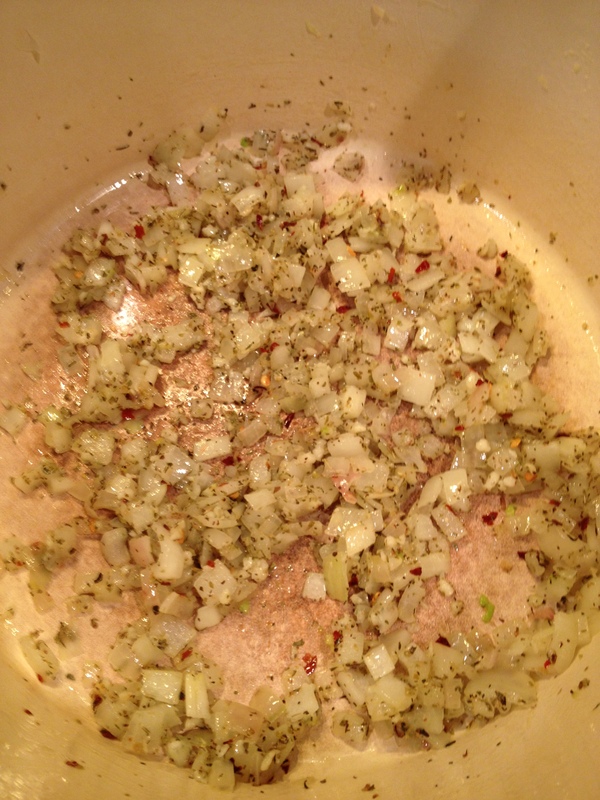 To start, the aromatics. 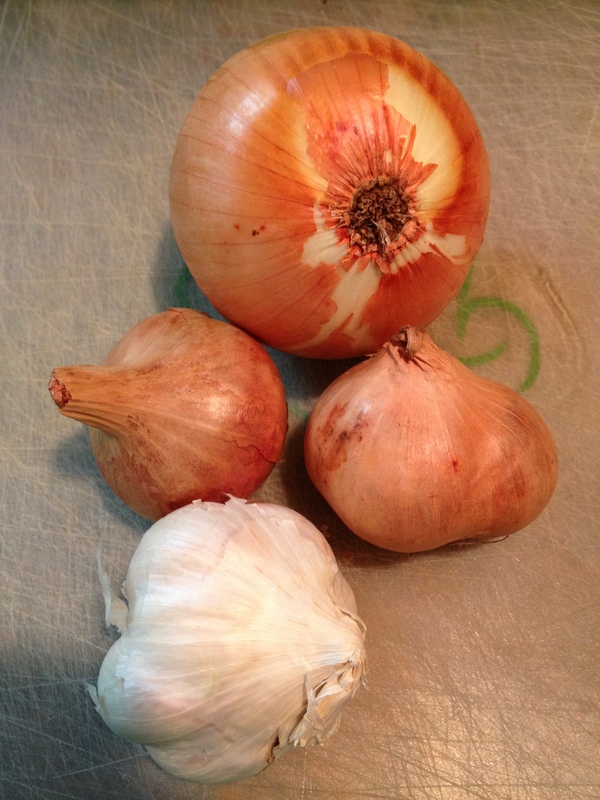 One medium onion, two shallots, and five cloves of garlic. 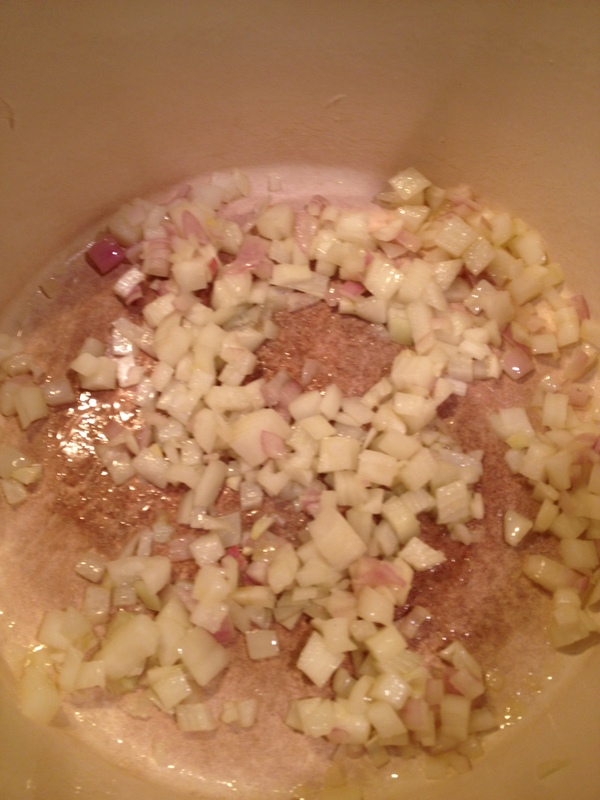 Roughly chop the onion and the shallots. I left the garlic whole to put through the garlic press. 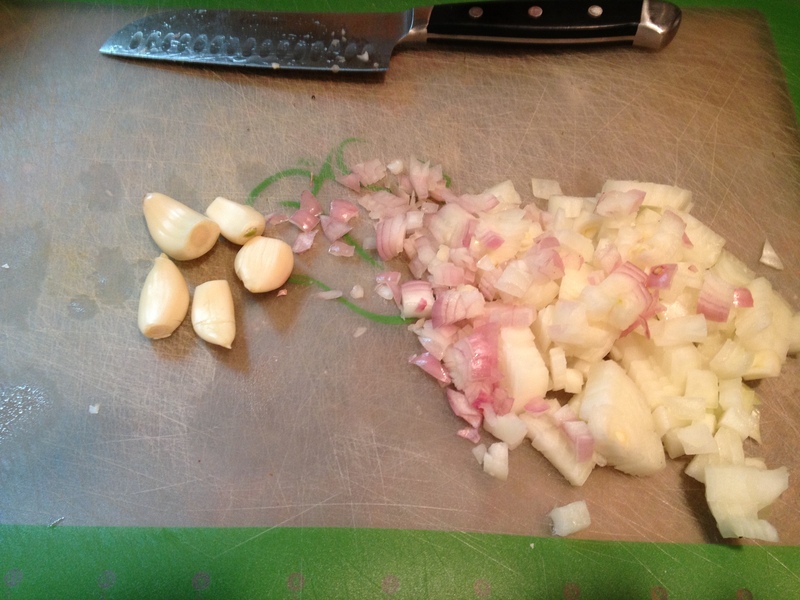 If you prefer, the garlic could just as easily be diced or grated. The onion and shallot go into my favorite dutch oven with about two tablespoons of extra virgin olive oil over medium heat. My favorite olive oil right now is Arbequina because it has such a rich buttery taste. 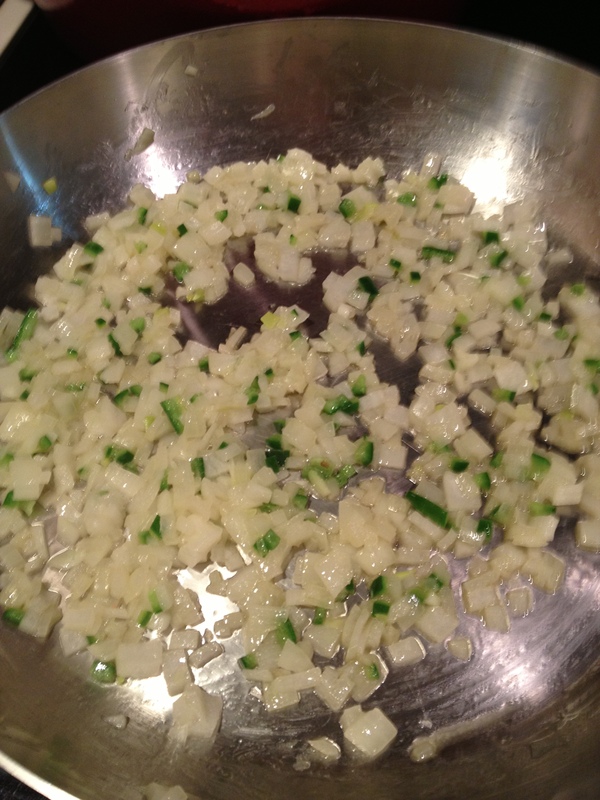 Once the onion and shallot start to get tender, press in the garlic. Add dried oregano, basil, red chili flakes, salt and pepper. In the summer, I would definitely use fresh basil and oregano. Sadly, this time of year, I didn’t have any on hand. Saute two to three minutes until fragrant. By now, the smells of the spices wafting through the house will make your mouth water. Add four cups of unsalted seafood stock. 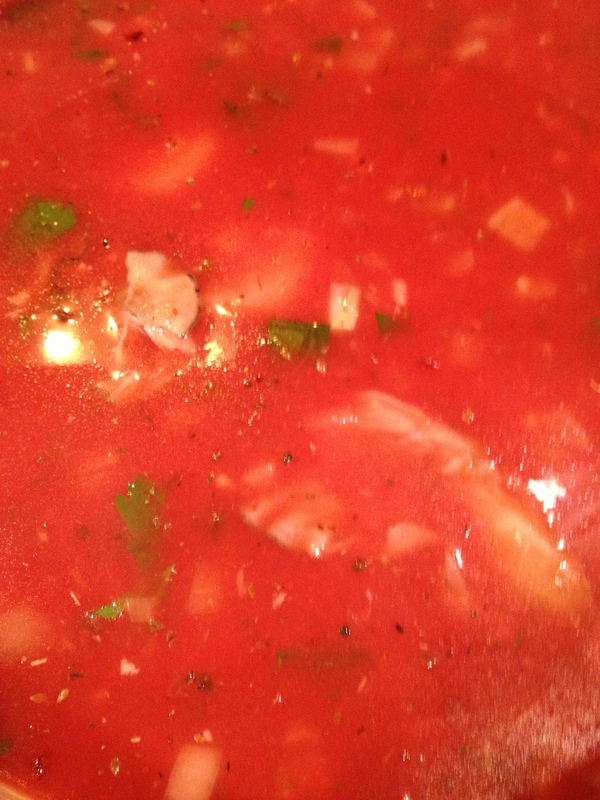 If you don’t have seafood stock clam juice or vegetable stock would work nicely as well. 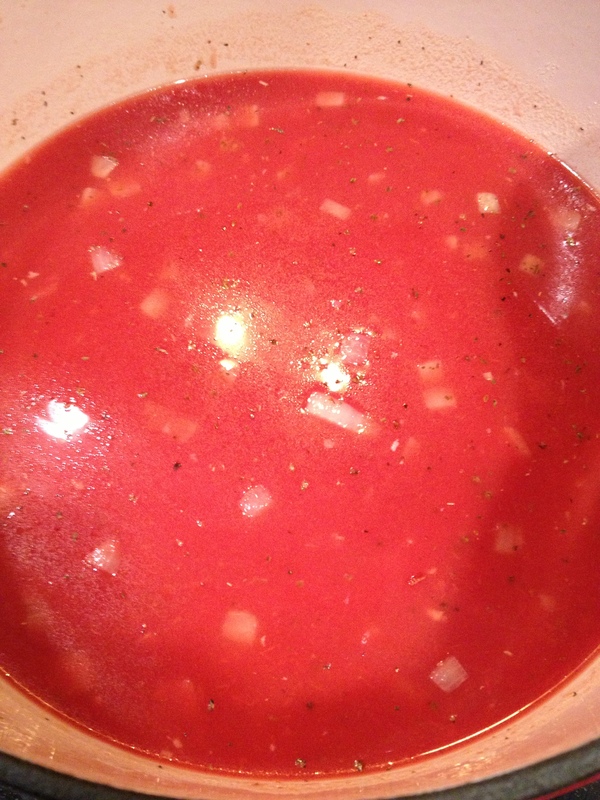 Whichever stock you choose, I recommend sticking to unsalted so you control the sodium in the recipe. 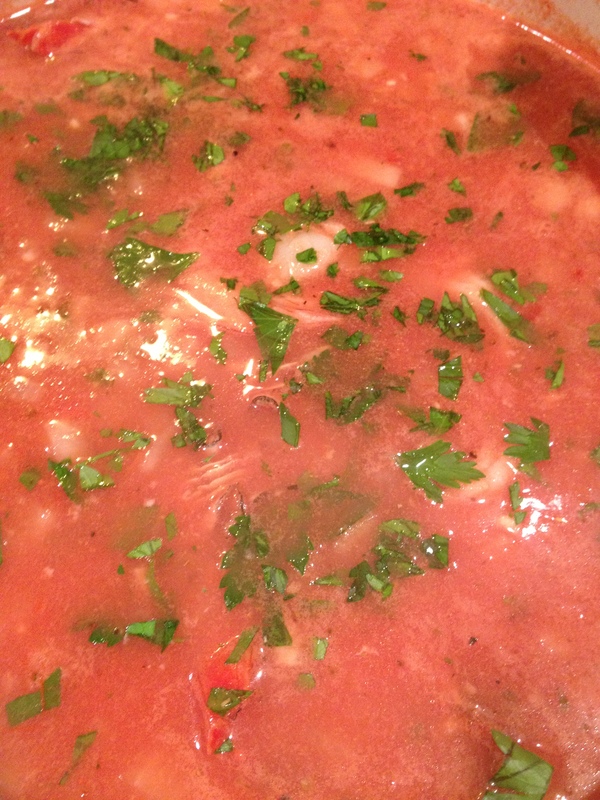 Also add in one thirty-two ounce can of chopped san marzano tomatoes. Now for the seafood. This can be varied according to your preference, what looks fresh, and what inspires you at your local seafood monger. I decided on one pound of cod, one pound of oysters, one pound of scallops and one pound of shrimp. Confession time. I bought the preshucked oysters. Less work and still fresh and delicious! The cod gets cut into roughly one inches cubes, while everything else stayed whole. I completely forgot to take pictures of the rest of the seafood, but I am sure you get the idea. 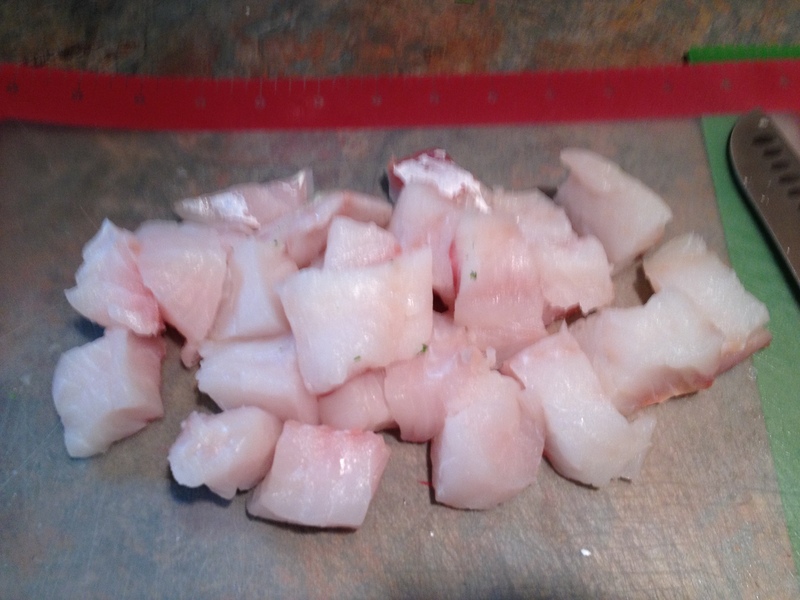 Add in a handful of chopped fresh parsley, the cod, scallops and oysters. Are you drooling yet? I was at this point! Cook for approximately three minutes. 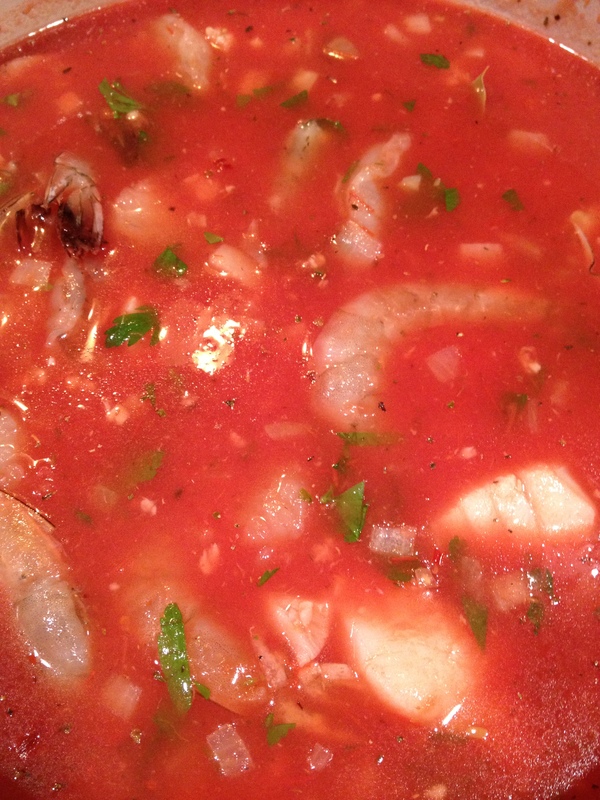 Now it’s time to add in the shrimp. Had the scallops been on the small side, I would have waited to add them until now as well. Simmer, covered for an additional four minutes or so until the shrimp are a beautiful shade of pink and fish flakes nicely. Most important word of advice? Do not over cook the seafood! At the last-minute, add in another handful of fresh chopped parsley. Enjoy with some nice crusty bread. My only regret with this meal? That we do not have larger bowls! A few years ago, my hubby and I spent the weekend in DC and had the pleasure of eating at Founding Farmers. If you’ve never been there and find yourself in DC, I highly recommend it. My hubby ordered the shrimp and grits and we agreed that it was the best shrimp and grits we had ever had. 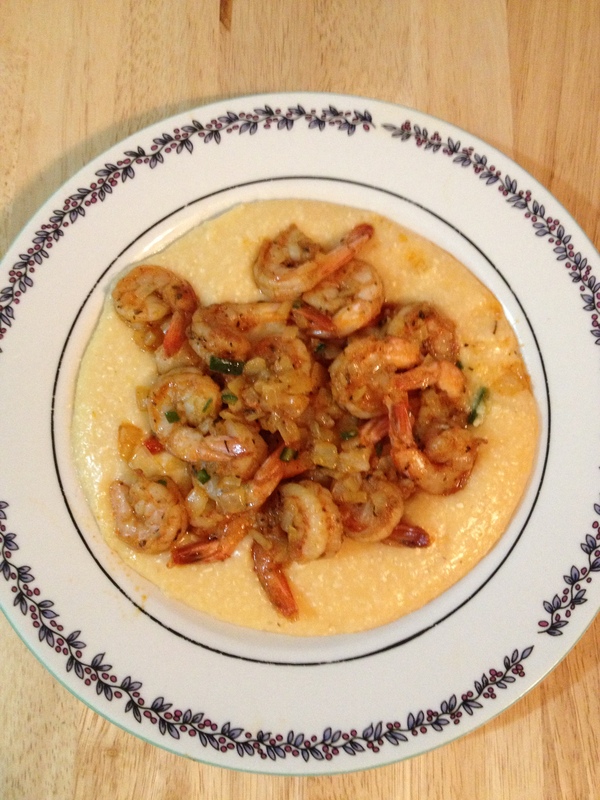 Since then, I have been dreaming of those shrimp and grits. Finally, I decided to create my own version. According to my hubby, they are even better. I am not so sure about that, but they are scrumptious! First things first, get the grits on the stove top. These will take the longest, about fifteen to twenty minutes. Boil three and a half cups of water in a large skillet. 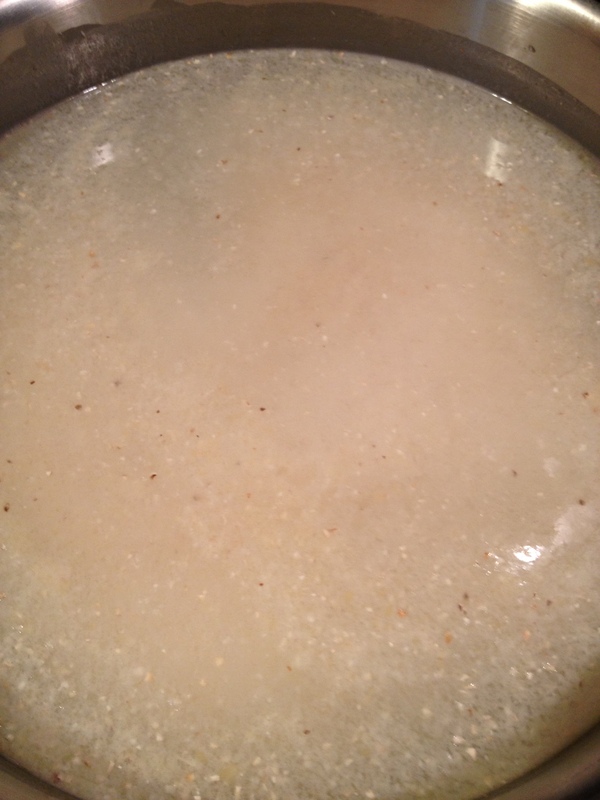 Once boiling add three-quarters cup of grits, one teaspoon of salt, and one tablespoon of earth balance. Cover and stir occasionally. Meanwhile, dice up one onion and one serrano chili. I was looking for a little kick to balance out the creaminess of the grits and I found it in the serrano! Melt one tablespoon of earth balance in a skillet over medium heat. 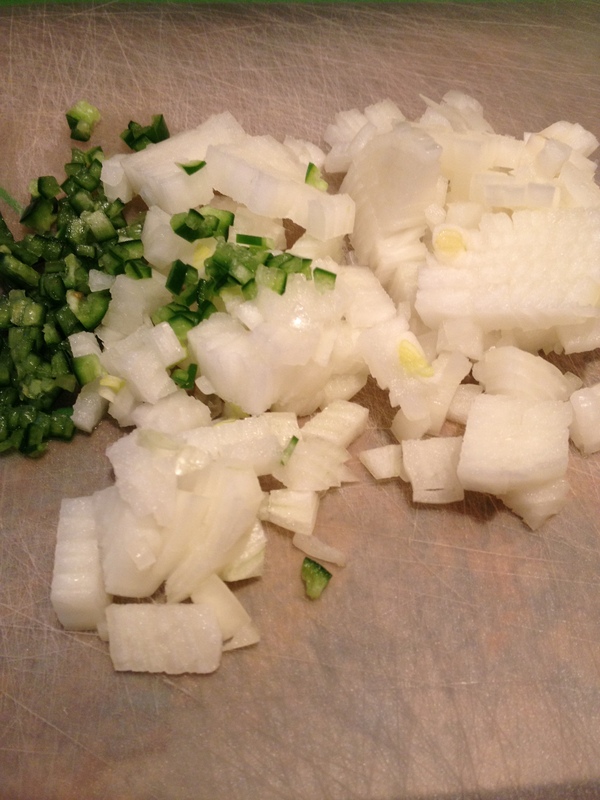 Add the onion, serrano and a pinch of salt. Saute until the onion is translucent, only a few minutes. This is where the creole mix comes in. You can use store-bought mix, but I prefer to mix up my own so that the seasoning can be switched up to taste. It is like a party in your mouth! I always have some on hand. 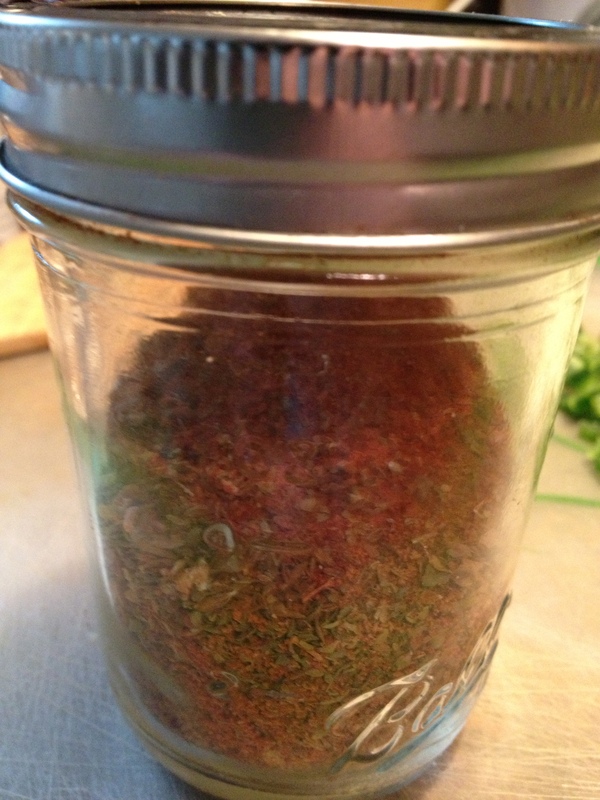 To make the creole mix, in a small mason jar combine: six tablespoons of sweet paprika, two tablespoons of onion powder, two tablespoons of garlic powder, two tablespoons of dried oregano, two tablespoons of dried basil, two tablespoons of cayenne pepper, one tablespoon of dried thyme, one tablespoon of black pepper, one tablespoon of white pepper, and one tablespoon of celery seed. Shake well to combine. 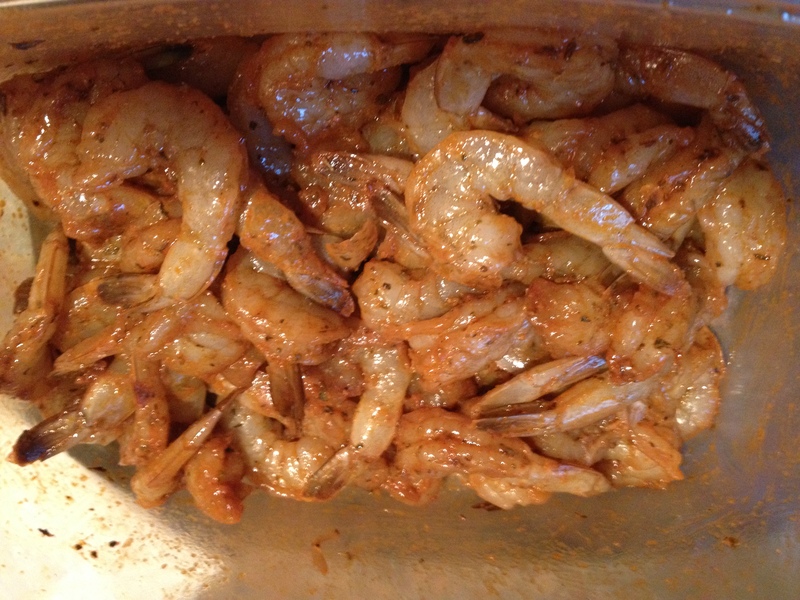 Generously coat one pound of peeled and deveined shrimp with the creole mix. Get your hands in there and get dirty! Our hands are our best kitchen tool. All this time, the grits should have been stirred occasionally. At this point, add in one-half cup of non-dairy cheddar cheese and stir well to combine. Continue to simmer. 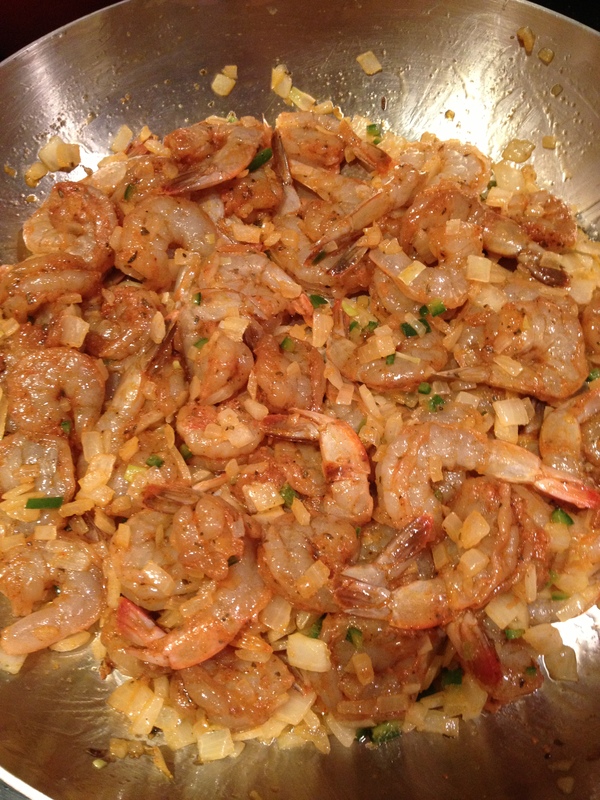 Add the shrimp into the skillet with the onion and serrano. Saute until the shrimp begin to get pink. It will not take long, only two to three minutes. Do not over cook the shrimp! Rubbery shrimp will not be scrumptious shrimp. 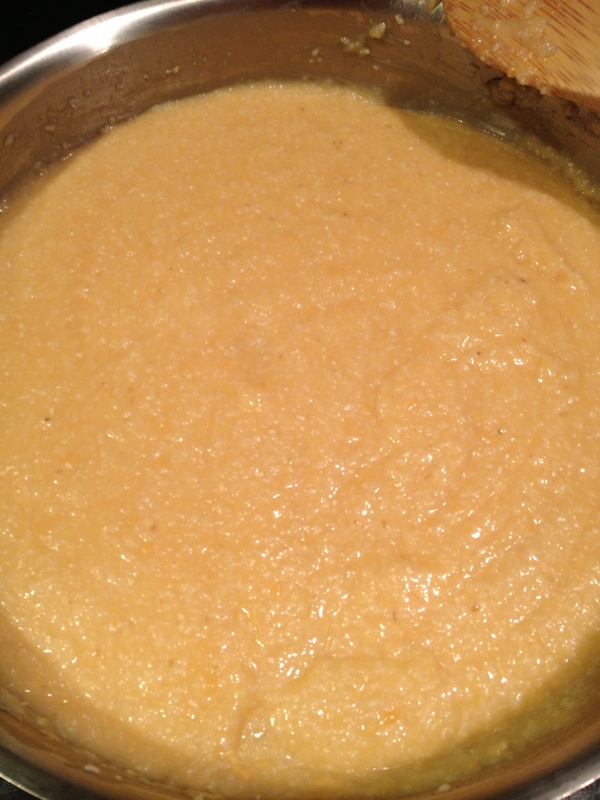 The grits are done when they are nice and tender, as well as deliciously creamy. The shrimp are done when they are nice and pink. 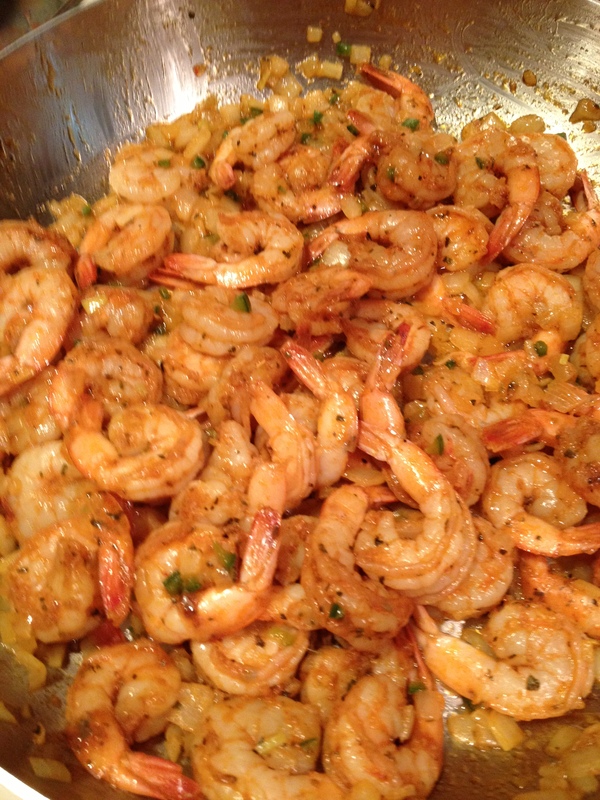 I can not say often enough….do not over cook the shrimp! Time to plate up and enjoy. 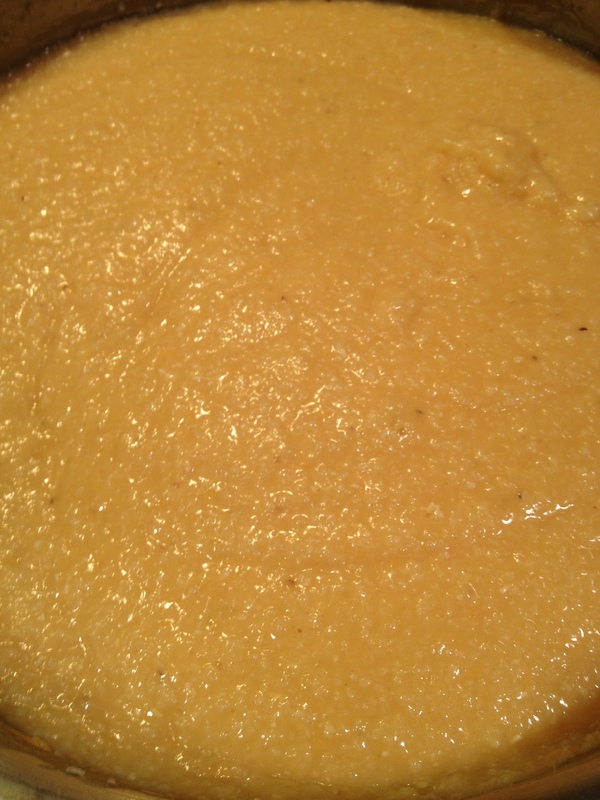 Create a pool of the cheesy (non-dairy that is), creamy grits and spoon the shrimp mixture over them. Dig in!